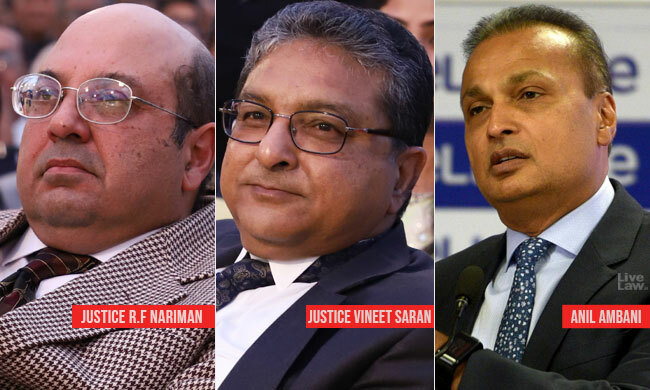 The Supreme Court bench of Justices R F Nariman and Vineet Saran today reserved orders on the contempt petitions filed by Ericsson against the Chairman of Reliance Communications Ltd (RCom) Anil Ambani and other officials. Ambani was present in Court today along with Reliance Telecom Ltd Chairman Satish Seth and Reliance Infratel Ltd Chairperson Chhaya Virani. Dushyant Dave, senior counsel appearing for the Swedish company, advanced vehement submissions seeking contempt action against Anil Ambani. "They live like emperors, with all luxuries...but they have no intention to honour the commitment made before this Court. They have money to pay for Rafale....but cannot pay off our debts", Dave said fervently. Senior Advocate Mukul Rohatgi, appearing for Ambani and officials, denied any contemptuous behaviour on the part of his clients. He said that the commitment was made by the company, and therefore individual liability cannot be fastened on the Chairman and officials. Also, the undertaking was not unconditional; it was conditional on the deal between RCom and Jio falling through. Since the deal could not be finalised due to objection by Department of Telecommunications, the condition in the undertaking was not fulfilled, said Rohatgi.